Emission free sail cargo soon to arrive in Belém, Brazil. The world’s ONLY trans-Atlantic sail cargo vessel, the Tres Hombres, will arrive in Belém, Brazil for the first time on the 30th of December, 2013 as part of it’s fifth consecutive journey from Europe to the Caribbean. 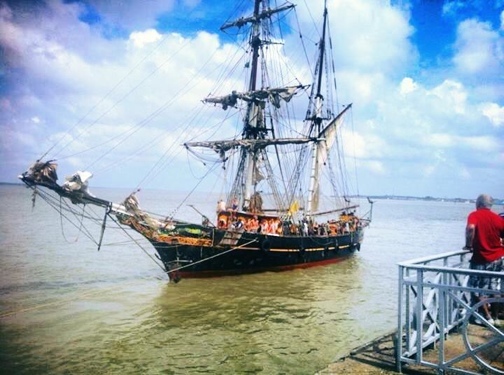 The Tres Hombres set sail from Holland on the 18th of October on a voyage to Brazil to source the finest Brazilian produce for European markets from the mouth of the Amazon. The main cargos of interest are the superfoods, açaì and guarana along with other products including coffee. On route to Brazil, the Tres Hombres has visited Norway sourcing the famous salt fish, ‘bacalao’, France to collect wine, Portugal collecting olive oil & wine, and the Canary Islands to source ‘Tres Hombres’ Rum. After visiting Brazil, the Tres Hombres will sail through the Caribbean to collect chocolate and ‘Tres Hombres’ Rum from the Dominican Republic. The ship will be berthed at Stação das Docas , Porto de Belém, Armazem 05 from the 26th of December until 4th of January 2014 (Dates could be subject to change). The ship returns to Europe in April 2014 powered only by the wind with a fairly transported, ‘emission free’ cargo and a ship full of stories. We invite you to join us along the way; the Captain, Lammert Osinga, and his crew welcome the press / public to come aboard and visit this unique sailing vessel with its very special mission! - if we can deliver a cargo ‘emission free’ to Europe for you. - if you would like a cargo delivered ‘emission free’ from Europe to Brazil in 2014. - if you have products that may be of interest to our business. - if you would like to promote us. - if you just want to find out more! Tres Hombres Ship is operated by Fairtransport Shipping, a Dutch company initiated by three sailing friends, the Dutchmen Arjen van der Veen and Jorne Langelaan and the Austrian Andreas Lackner. Fairtransport Shipping are supported on this voyage by their UK agents New Dawn Traders Ltd.
Our shared mission is to create an emission free fleet of sail cargo ships thereby removing fossil fuels from global supply chains. The Atlantic Foundation, the umbrella company of Fairtransport Shipping and Tres Hombres Ship has developed designs for high tech sailing cargo ships which are waiting to be built for transporting high volumes of low emission ‘Fair Transport’ cargo. Fairtransport Shipping and New Dawn Traders are working locally in Brazil with Flora and Fauna, a sustainable tourism company founded in 2013, focusing on ecotourism and green labeling of ecological products sourced from the region. Fauna and Flora are acting on behalf of Fairtransport Shipping as the harbour agents and brokers in Belém, and are pleased to be supporting the arrival the first merchant vessel, without an engine, to Brazil in the 21st century! The arrival of the Tres Hombres Ship opens up opportunities for local markets to sustainably export their goods worldwide. Join us in driving a revolution in shipping – From A to B Emission Free!